Stephen Fox works with Nuveen’s sales force and the advisors they serve in the eastern half of the United States, focusing on secondary closed-end fund market ideas and insights, as well as new product offerings. 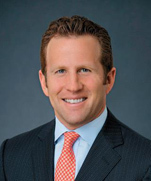 Prior to joining Nuveen Investments in 2013, Fox was Managing Director, Head of Fixed Income Credit Analytics & Product Solutions at Morgan Stanley where he managed a team of fixed income credit analysts and product specialists responsible for idea generation, swaps, and credit analytics for financial advisors. During his 15 years with Morgan Stanley, Fox was promoted through key roles in their Capital Markets business and ran numerous sales teams across asset classes, helping advisors find the right solutions for their clients. He holds a bachelor’s degree in finance from Miami University (Ohio) and is FINRA Series 7, 24, 53 and 63 registered.